Milwaukee’s Water Works are now run as a public institution. The Metro Milwaukee Sewerage District (MMSD) facilities are run by a private corporation (Veolia) and overseen by the MMSD commissioners. MMSD is run by a Commission made up of eleven members. Seven are appointed by the mayor of the City of Milwaukee (subject to Common Council confirmation). At least three must be elected officials and each of the seven members must have his or her principal residence in the City of Milwaukee. Photo of deep tunnel addition, Spring 2009. vb Four Commission members are appointed by the Executive Council of the Intergovernmental Cooperation Council (ICC) which is composed of the mayors and village presidents of the Milwaukee County suburban municipalities (excluding South Milwaukee). At least three of these appointees must be elected officials and each of the four members must have his or her principal residence within the District but outside of the City of Milwaukee. At one time MMSD was run as a public institution comparable to Milwuakee Water Works. These two units of public infrastructure are a good place to look for comparisons as to whether public or private running of facilities provides the best outcome. What is most disturbing about the proposal to privatize Water Works is the length of the lease (75 to 100 years). The contract with Veolia to run MMSD is 10 years. I might – and the decision makers who signed the contract with Veolia might – still be alive 10 years from now. No adult will be alive 100 years from now, barring medical gymnastics. 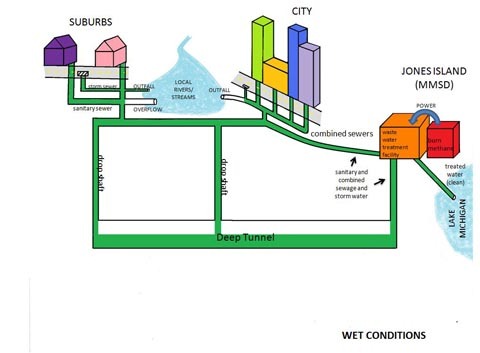 Want to read a Marquette Service Learning student’s analysis of water systems in Milwaukee and how they work? Continue on… by Sara Paulus – Service Learning Project Marquette Univeristy for River Revitalization Foundation History of Milwaukee Water It’s the late 1800s in Milwaukee, and the city has finally decided to construct its first water works system. Before 1874 the city of Milwaukee had no organized water system, relying mostly on water carts that delivered water to its citizens and wooden pipes that brought water from springs to business areas (Becker 1). The beginning of Milwaukee’s water system started with the construction of a pumping station that pumped water for consumption, or potable water, to citizens. This was then followed by the construction of a flushing station that would help clean the Milwaukee River where waste water, or sewage, was dumped. Next, the issue of sewage disposal was addressed and the Milwaukee Sewerage District, now Milwaukee Metropolitan Sewerage District (MMSD), was created. MMSD works on a variety of projects concerning the sewage system including its fairly new deep tunnel project. Throughout history many advancements and necessary changes have been made concerning Milwaukee’s water system, and more specifically its sewage system, resulting in what continues to exist today. Although it seems quite absurd that Milwaukee could survive without a water system until the late 1880s, the cost of building and running a system was very expensive at the time and seemed an impossible feat for the city. After a high increase in disease due to contaminated water and the necessity of water for putting out fires, the city finally decided to apply for permission to build a water system from the Wisconsin State Legislature (Becker 2). After much discussion, the city decided to build a pumping station on the Lake Michigan Shore that would pump lake water to Milwaukee citizens throughout the city (Becker 3). In 1874 the pumping station was constructed, and during the first year, 1,250,000 gallons of water were pumped every day to 1,807 customers. The pumping station contained two pumping engines. If both pumps were functioning properly, they had the capacity to dispense 16 million gallons of water every day; the equivalent of supplying 320,000 customers with 50 gallons of water per day (Becker 9). Amazingly, Milwaukee had successfully created its first water distribution system, but still problems would arise and changes would be needed. Although Milwaukee’s potable water distribution system was functioning well in the 1800s, all of the waste water emptied directly into the slow moving Milwaukee River estuary. This slow movement combined with the sewage caused an awful stench. To combat this problem, the city designed the Milwaukee River Flushing Station. In 1888, the flushing station was completed and pumped 500 million gallons of water daily from Lake Michigan into the Milwaukee River estuary (“The Milwaukee River” 2). Essentially, this pumping of water increased the flow of the river estuary, pushing the sewage downstream and allowing the water in this area to return to its earlier, cleaner state (“The Milwaukee River” 4). Interestingly, the flushing station is able to function today to help keep the river estuary clean and flowing at a faster rate (“The Milwaukee River” 11). Still, this was only a temporary solution to deal with Milwaukee’s sewage problems, and definite and needed improvements would eventually be made. Since the Milwaukee River ultimately flows into Lake Michigan, the sewage being flushed out of the river ended up in the Lake. Although the lake is able to handle some sewage without serious affects, the amount of untreated sewage dumped into the lake in the late 1800s and into the 1900s resulted in dangerously contaminated water. This was a severe problem because, as mentioned before, the lake was where the city got its potable water from. In the early 1900s, discussion of further treatment of Milwaukee’s sewage arose. With the amount of contaminated lake water rising, the need for a sewage disposal plant to treat waste water or a water purification plant to provide potable water was heightened. Furthermore, an outbreak of typhoid in 1909 alerted city officials to seriously consider a sewage disposal plant. Moreover, in 1912, the Health Department tested water from city hall. The department found that 40% of the time the water contained contaminants suggesting that a sewage treatment plan should be built (Hein 4). Finally, in 1925, a sewage treatment plant was built on Jones Island to treat waste water. Also, Linnwood Avenue Purification Plant was built in 1934 to provide potable water to citizens. Both of these systems tremendously improved the water quality in Milwaukee and the surrounding suburbs. Two groups helped to implement the construction of these plants: The Milwaukee Sewerage Commission that dealt with the city’s sewage problems, and The Metropolitan Sewerage Commission that dealt with sewage problems of areas surrounding the city. Eventually, these groups were discontinued, and a new group, the Milwaukee Metropolitan Sewerage Commission, was formed to oversee the Milwaukee Metropolitan Sewerage District (MMSD) (Hein 4). With the advances throughout the 1900s, an obvious increased awareness and interest in water quality can be seen, revealing it was an important issue in the city of Milwaukee at the time. This interest in water quality remains today as the MMSD continues to make improvements to Milwaukee’s sewage system. The MMSD mainly works to recycle water and to prevent flooding. In doing this, MMSD helps to maintain water quality throughout most of Milwaukee including surrounding suburbs (“About Us”). In addition to water recovery and flood prevention, MMSD also takes part in the following: “water quality research, household hazardous waste collection, pharmaceutical collection, industrial waste monitoring, laboratory services, planning and engineering services, and [production of] Milogranite,” a fertilizer made from solids removed during the waste water treatment process (“About Us”). Clearly, MMSD continuously works to find better ways to ensure clean water. For example, one large and fairly new project is the deep tunnel system, a series of tunnels that help to prevent overflows of untreated sewage. In turn, this system helps to improve water quality (“Deep Tunnel”). The deep tunnel system was part of a three billion dollar project instigated by a court order insisting that MMSD comply with the Clean Water Act of 1977 to stop allowing sewage to flow into local bodies of water. This tunnel system is 300 feet underground and stretches 19.4 miles with a diameter ranging from 17 to 32 feet allowing the tunnel to hold a remarkable 405 million gallons of water. When sewer pipes are filled to capacity, water is able to be temporarily stored in the tunnel until the Jones Island treatment facility has room to treat it. Before the installation of the deep tunnel, about 50 to 60 overflows, which result in a discharge of untreated sewage into bodies of water, occurred every year. Remarkably, these overflows have been reduced to, on average, 1 to 2 times a year (Gunn 84). 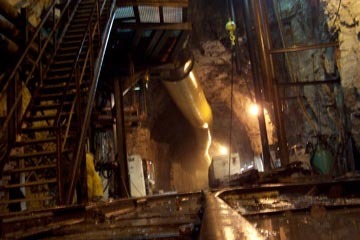 Without a doubt, the deep tunnel works to help prevent mass amounts of sewage from being dumped into local waterways. Still, when severe storms do occur, the system’s ability to hold large amounts of water becomes strained (Kreiling 16). Unfortunately, some people regard this as the system not working as designed (Gunn 87), and essentially, a waste of money. Even with the exceptional advances MMSD has made with sewage treatment and its continuous improvements, people still believe their money that goes towards MMSD projects is for nothing (Gunn 82). Overall, it seems the tunnel system is not perceived as working well, especially with the harsh criticisms that result whenever an overflow occurs (Gunn 87). Some research studies even show the deep tunnel in a negative light. For example, the Wisconsin Policy Research Institute completed a study that reported the number of overflows after the installation of the deep tunnel. The numbers the institute reported, according to its own view, did not meet the standards that the deep tunnel design was supposed to meet. On average, the number of combined sewer overflows (CSOs) from 1994, the year the tunnel system opened, to 2001, was 3 per year (Hein 11). Obviously, the average of three overflows per year did not comply with the goal of less than two CSOs per year, but still, immense improvements had occurred, when originally, CSOs occurred 50 to 60 times per year. Additionally, by permit, six combined CSOs are allowed per year, and the reported data from 1994 to 2001 did follow the criteria as no more than six CSOs occurred per year (Gunn 87). More recent statistics, reported from an article published in 2008 and previously mentioned, state the average is just 1 to 2 times per year (Gunn 84). Also, the Wisconsin Policy Research Institute’s study reported that 39 sanitary sewer overflows (SSOs) occurred between 1994 and 2001. The institute viewed this as unacceptable because zero SSOs are supposed to occur with the Deep Tunnel in place (Hein 11). On the other hand, MMSD argues that sanitary overflows only occur in order to prevent basement flooding and property damage, and when no other viable option exists. Also, the amount of water released is a miniscule amount when compared to combined sewer overflows, which are allowed (Gunn 88). Surely, MMSD tries all possible options, including storing water in the deep tunnel, before allowing a SSO. Either MMSD allows the overflow, or this water goes back to where it came from causing backwash into homes and businesses. Furthermore, MMSD follows a practice called “blending” when an overflow, including both sanitary and combined, must occur. This process involves mixing treated water with untreated water, disinfecting this mixture at the Jones Island treatment facility, and then releasing it into waterways. Although not the ideal treatment of water, the process of blending greatly reduces contaminants (“Treatment Process”). Moreover, some critics accuse overflows as the cause for beach closings due to high amounts of coliform bacteria (found in human and animal feces). However, UW-Milwaukee conducted a research study to figure out the main source of coliform bacteria in Lake Michigan. Contrastingly, the source was not from overflows as many people believed, but instead, from seagull droppings (Gunn 86). Besides coliform bacteria, another cause of contaminants, and actually, “the single biggest cause of pollution” in Milwaukee waterways is storm water runoff (Gunn 84). Storm water runoff results when rain water or melting snow runs over various types of ground and simultaneously collects the contaminants on these surfaces. This runoff then goes into the local waterways.Clearly, overflows are not the major reason for a majority of the contaminants found in the water. Still, the fact remains that overflows do occur within the Milwaukee sewage system, but people must realize what problems would exist if the Deep Tunnel System had not been installed. Their money definitely has been used well although they only seem to see the imperfections with the system. Truthfully, the Deep Tunnel was meant to reduce overflows, not eliminate them, and therefore, the system definitely works as designed and works well (Gunn 87). Moreover, improvements on the Deep Tunnel are scheduled to be completed or are already under construction. One improvement includes adding a two mile extension to the tunnel allowing an additional 27 million gallon water holding capacity (Kreiling 17). Another improvement includes a plan to “reroute two to four billion gallons of flow a year away from the Deep Tunnel System during rainstorms,” (Kreiling 17). Both projects would help to decrease the chance of overflows even more. Even with plans for improvements, some may wonder if their money is truly being used effectively. Fortunately and unsurprisingly, the answer is “yes.” MMSD uses a software program that allows them to see what projects are most necessary and those that aren’t needed at all (Kreiling 18). When money is available, MMSD puts it to use in the most effective way, and when money is scarce, MMSD only uses it where necessary, which results in having to slow down or even stop some projects (Kreiling 19). Don Nehmer, the capital program business manager for MMSD, stated that “ ‘With [the software program], our staff has become more efficient. Today we can definitely do more with less,’ ” (Kreiling 19). This statement should reassure people who continue to remain skeptical about the deep tunnel and other MMSD projects. Now, it’s 2009, and the city of Milwaukee continues to work to make improvements to better the quality of local waterways. Although much is different from its beginnings in the late 1800s, a common need and desire for clean water seems to weave the past, present, and future of Milwaukee’s water system together. The importance of the water system will forever play an important part in keeping Milwaukee and the surrounding suburbs beautiful, and more importantly, functioning healthily. Works Cited “About Us.” Milwaukee Metropolitan Sewerage District. Milwaukee Metropolitan Sewerage District. 19 Apr 2009 <http://v3.mmsd.com/ AboutUs.aspx>. “ Becker, Elmer W. A Century of Milwaukee Water. Milwaukee, WI: Milwaukee Water Works, 1974. Print. “Deep Tunnel.” Milwaukee Metropolitan Sewerage District. Milwaukee Metropolitan Sewerage District. 19 Apr 2009 <http://v3.mmsd. com/deeptunnel.aspx>. Gunn, Erik. “Clean Machine.” Milwaukee Magazine May 2008: 82- 88. Print. Hein, Susan S. “Government Pollution: The Metropolitan Milwaukee Sewerage District’s Impact on Lake Michigan.” Wisconsin Policy Research Institute Report 16(2003): 4, 11. Print. Kreiling, Janet. “Stemming the Flow.” Primavera Magazine Summer 2007 14-19. Web.19 Apr 2009. <http://www.primavera.com/files/ customers/MilwaukeeMetropolitanSewerageDistrict.pdf#xml=http:// search.primavera.com/texis/search/pdfhi.txt?query=Stemming+the+Flo w&pr=prim&prox=page&rorder=500&rprox=500&rdfreq=500&rwfre q=500&rlead=500&sufs=0&order=r&cq=&id=49eada23b>. “The Milwaukee River Flushing Station.” American Society of Mechanical Engineers. 15 Nov 1992. American Society of Mechanical Engineers. 19 Apr 2009 <http://files.asme.org/asmeorg/ Communities/ History/Landmarks/ 10267.pdf>. “Treatment Process.” Milwaukee Metropolitan Sewerage District. Milwaukee Metropolitan Sewerage District. 19 Apr 2009 <http:// v3.mmsd.com/TreatmentProcess.aspx>.